A unique store like none other, providing Antiques for over 40 years. Our family business brings you a vast experience and knowledge of Antiques. You can trust that every piece is carefully selected by Yvonne herself from Europe and around the world for its style and unique nature. You can be assured whatever your desire your purchase from Yvonne Sanders Antiques will be of the highest quality to enhance your Home or Business to a new level of Design. This Book is a high quality Publication of 304 pages, two thirds of which are photographic. Tessa Chrisp, (New Zealand Photographer of the Year 2011) did almost all of the Photography. It is 28 cm x 22 cm and easy to handle. 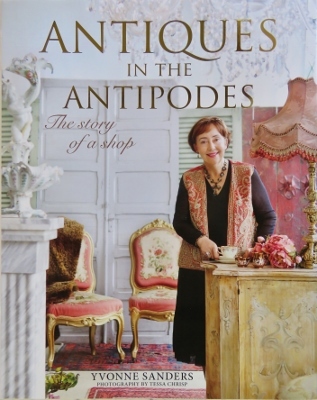 The content covers the story of Yvonne Sanders Antiques, initially, but is mostly a social history of the Antique Trade over the past 40 years covering my Craftsmen, Collectors, Colleagues and Decorators. A perfect Coffee Table Book or 'Mothers Day' Gift! I think you will enjoy it!! Available from our Shop, online here or in good bookstores. New stock arriving every week. Have some antiques that you wish to sell? Then email some images to yvonnesanders@xtra.co.nz with your contact details. Beautiful Chandeliers and lights are one of our specialties. We have a stunning range of Antique and Reproduction light fixtures that will delight and surprise you. Our Furniture is sourced from Europe and around the world. We pride ourselves in finding just the right pieces to enhance your home. We stock an impressive range of Restoration Products suitable for all your furniture needs. Brands include, Liberon, Briwax and Antiquax. We stock Antique doors, iron gates, shutters and a range of cement tiles. Most of stock is available for hire. Whether you are planning a Special Event or involved in Film, Television Productions or Advertising we are happy to help with all your Hireage needs. - Glassons use French Floor Tiles. - Bendon Lingerie at Saint Luke's wins Design Award. - Ortega Fish Café & Bar create mosaic with Floor Tiles.